"I've never seen anything like this before in the local universe," said astrophysicist Stephen Smartt, part of the ATLAS team at the Keck Observatory in Mauna Kea, Hawaii. Astronomers with More than a dozen telescopes from all over the world have spotted a mysterious colossal explosion 200 million light-years from Earth– a giant cloud of high-speed particles moving at a rate of 12,000 miles per second and registering a temperature of 16,000 degrees Fahrenheit. Nicknamed "The Cow," the explosion was first spotted using the ATLAS telescope. 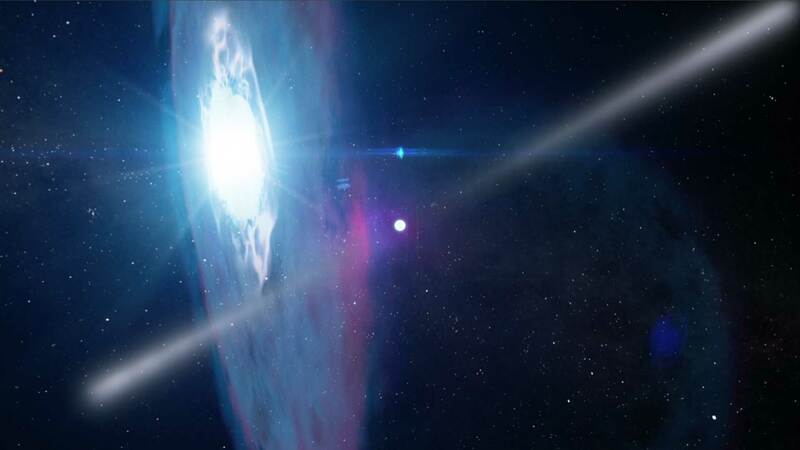 The astronomers estimate it to be 10 to 100 times more luminous than a regular supernova, which can generate more light and energy in a flash than the Sun can in its entire lifetime. The observers noted that the explosion happened over an exceptionally short amount of time. Usually, it takes a few weeks for a cosmic explosion to reach its brightest point. However, this time the explosion climaxed in two days before the brightness began to dwindle. The NASA image above is of an ancient pulsar 100 times brighter than the entire Milky Way galaxy. "It really just appeared out of nowhere," says Kate Maguire, an astronomer at Queen's University Belfast and a member of the team that mans ATLAS. "There are other objects that have been discovered that are as fast, but the fastness and the brightness, that's quite unusual." Following the initial observation in Hawaii, numerous reports have been sent to Astronomer's Telegram, a website for astronomers around the world to send reports of interesting finds. The website's automatic naming system has given it the name AT2018cow, hence the nickname The Cow. At least 18 telescopes across four continents are said to have been trained on the mysterious object. Robert Rutledge, Editor-in-Chief of Astronomer's Telegram and astrophysicist at Canada's McGill University, says AT2018cow received the biggest number of reports for a single astronomical object over the span of a few days. Some experts initially suggested that the explosion could have happened within the Milky Way because of its unusual luminosity. It is remarkably bright across all spectrums, including visible light, X-ray, and electromagnetic. However, a spectroscopic analysis done by astronomers in China reveals that the explosion took place in a galaxy called CGCG 137-068 in the constellation Hercules. The light signature on the object shows it took 200 million light years for the light from the explosion to reach observers on Earth. "This does look like it is quite a rare object," Smartt says. "Just the fact that it's detected over all these wavelengths leaves a lot of rich physics to understand."